AUD 32,045 Excl. Duties / Taxes. This Marquise diamond is 2.11 carat in weight, and comes with Very Good polish and Good symmetry, as verified from an independent gemological laboratory. The diamond is graded F in colour, and has a clarity grade of VVS2. The diamond's GIA grading report number is 1196491108, which will detail further its specifications and measurements, and will also come with the purchase of the stone. AUD 6,528 Excl. Duties / Taxes. This Marquise diamond is 1.24 carat in weight, and comes with Good polish and Good symmetry, as verified from an independent gemological laboratory. The diamond is graded G in colour, and has a clarity grade of SI2. The diamond's GIA grading report number is 5202141344, which will detail further its specifications and measurements, and will also come with the purchase of the stone. AUD 4,579 Excl. Duties / Taxes. This Marquise diamond is 0.8 carat in weight, and comes with Good polish and Good symmetry, as verified from an independent gemological laboratory. The diamond is graded E in colour, and has a clarity grade of VS1. The diamond's GIA grading report number is 5151821167, which will detail further its specifications and measurements, and will also come with the purchase of the stone. AUD 6,827 Excl. Duties / Taxes. This Marquise diamond is 1.43 carat in weight, and comes with Good polish and Fair symmetry, as verified from an independent gemological laboratory. The diamond is graded J in colour, and has a clarity grade of SI1. The diamond's GIA grading report number is 1182101086, which will detail further its specifications and measurements, and will also come with the purchase of the stone. AUD 3,014 Excl. Duties / Taxes. This Marquise diamond is 0.85 carat in weight, and comes with Good polish and Good symmetry, as verified from an independent gemological laboratory. The diamond is graded F in colour, and has a clarity grade of SI2. The diamond's GIA grading report number is 1152525090, which will detail further its specifications and measurements, and will also come with the purchase of the stone. AUD 10,506 Excl. Duties / Taxes. This Marquise diamond is 1.79 carat in weight, and comes with Good polish and Good symmetry, as verified from an independent gemological laboratory. The diamond is graded J in colour, and has a clarity grade of VS2. The diamond's GIA grading report number is 2195430710, which will detail further its specifications and measurements, and will also come with the purchase of the stone. AUD 21,778 Excl. Duties / Taxes. This Marquise diamond is 2.03 carat in weight, and comes with Very Good polish and Good symmetry, as verified from an independent gemological laboratory. The diamond is graded G in colour, and has a clarity grade of SI1. The diamond's GIA grading report number is 2183118511, which will detail further its specifications and measurements, and will also come with the purchase of the stone. This Marquise diamond is 0.49 carat in weight, and comes with Very Good polish and Good symmetry, as verified from an independent gemological laboratory. The diamond is graded F in colour, and has a clarity grade of SI1. The diamond's GIA grading report number is 6187037355, which will detail further its specifications and measurements, and will also come with the purchase of the stone. AUD 3,550 Excl. Duties / Taxes. This Marquise diamond is 0.87 carat in weight, and comes with Good polish and Good symmetry, as verified from an independent gemological laboratory. The diamond is graded I in colour, and has a clarity grade of VVS2. The diamond's GIA grading report number is 2155357573, which will detail further its specifications and measurements, and will also come with the purchase of the stone. 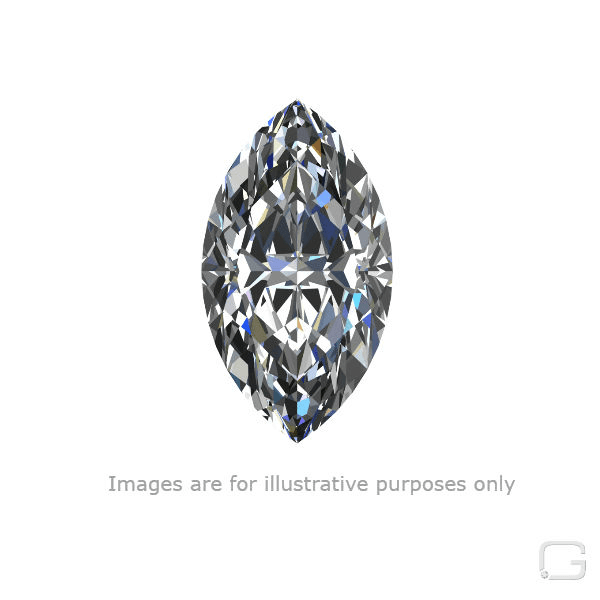 This Marquise diamond is 1.08 carat in weight, and comes with Good polish and Fair symmetry, as verified from an independent gemological laboratory. The diamond is graded J in colour, and has a clarity grade of VS2. The diamond's GIA grading report number is 1146819295, which will detail further its specifications and measurements, and will also come with the purchase of the stone. AUD 7,322 Excl. Duties / Taxes. This Marquise diamond is 1.08 carat in weight, and comes with Very Good polish and Fair symmetry, as verified from an independent gemological laboratory. The diamond is graded G in colour, and has a clarity grade of VVS2. The diamond's HRD grading report number is 180000003034, which will detail further its specifications and measurements, and will also come with the purchase of the stone.